Boxcopy is an artist-run organisation dedicated to supporting the experimental and innovative practices of early and mid-career Australian artists. We commission artists to develop and present new works within a critical context through a curated program of exhibitions, publications and events. As an artist run initiative, we embrace experimentation, collaborative processes and a d.i.y. approach to contemporary art practice. In 2015 – 2016 Boxcopy is developing a new major project, HOMEGROUND: Brisbane ARIs today and tomorrow. HOMEGROUND looks at the local context of artist run culture, focusing on the period from 2000, and beyond – ARIs now, their immediate predecessors and influences and the future of ARI practice in Brisbane. Boxcopy was founded as a collaborative project by 7 art school graduates in 2007 and initially operated from the basement of a Queenslander house in New Farm. This emphasis on the home and the local context are reflected in many Brisbane ARIs – they are fluid, nomadic structures with ‘projects’ occurring in domestic spaces, hotel rooms, the street and public sites. 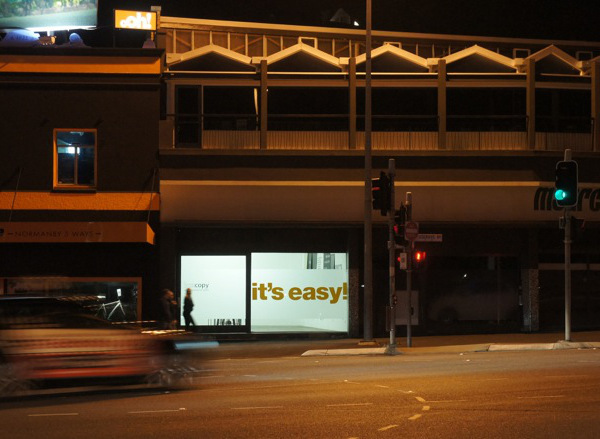 As one of the longest running ARIs in Brisbane with a consistent physical gallery space, Boxcopy becomes a potential conduit or homeground for collaborations to take place. In a similar way, the 2013 project Offsite brought together projects in the CBD by five Brisbane based ARIs and collectives with Boxcopy acting as the headquarters. In the lead up to the exhibition HOMEGROUND, Boxcopy will host a series of SlideShows titled History Never Repeats?, showcasing current Brisbane ARIs and their projects. On Saturday 20 June Boxcopy is hosting a special Artist Workshop with Gillian Fuller from Design and Australia Online (DAAO). DAAO is the largest free research database on Australian art and design. It is connected with cultural datasets around the world and syndicates to the National Library of Australia’s Trove service. Adding records to DAAO means your information will be preserved, enhanced and, most importantly, freely accessible to all. At Boxcopy we will be focusing on building profiles of Queensland artists, so choose an artist to ‘adopt’, and join us for the Datasprint from 10am. Places are limited – email info@boxcopy.org to register and receive further information about the daao.org.au.